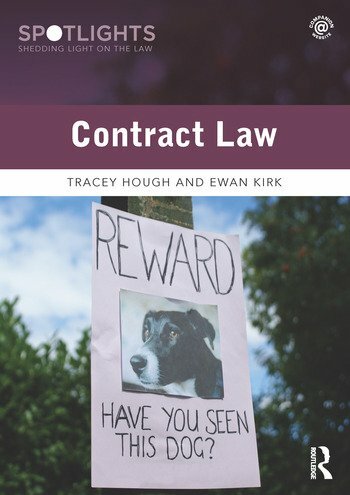 Contract Law is an engaging and accessible new textbook aimed at students on core LLB and GDL courses. Combining comprehensive coverage of the curriculum with carefully developed pedagogical tools, the authors help students learn, gain an enhanced understanding of how the law works, and develop their ability to apply this newfound knowledge and understanding in assessment situations. To be successful in assessments, students must be able to analyse and solve legal problems, while accurately and appropriately applying legal authority. The Spotlights series models these core skills alongside a full and thorough exposition of the substantive law. Tracey Hough is an Associate Professor and the LLB Programme Director at Birmingham City University. Ewan Kirk is Senior Lecturer in Law at Birmingham City University, where he has previously led the CPE/GDL Programme, as well as the LLB Programme and associated pathways.